At the request of Virginia’s Department of Environmental Quality, ICPRB investigated the potential for developing reference curves for chlorophyll a criteria from balanced, unstressed phytoplankton communities in the Chesapeake Bay. The intent was to inform the chlorophyll a criteria assessment process in the James River. 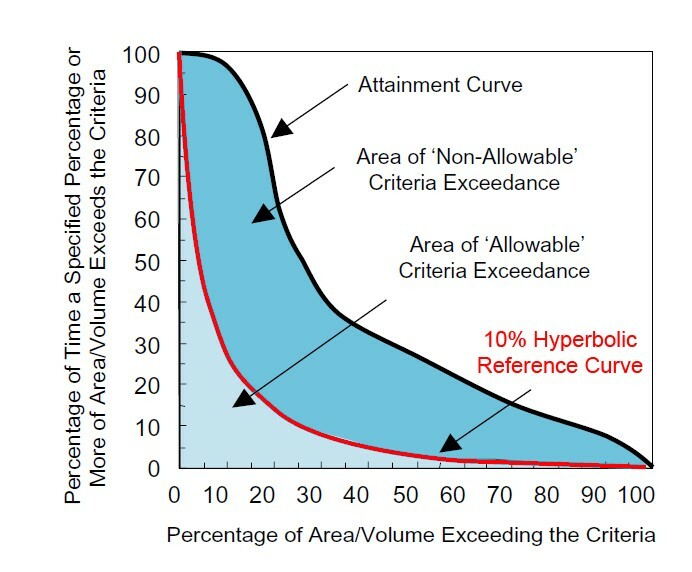 The project specifically addressed the question: do chlorophyll reference curves developed from actual data approximate the “10% rule” hyperbolic reference curve currently used in some criteria assessments (see graph). Exceedances of the James River chlorophyll a criteria in space and time for balanced, unstressed populations do approximate the 10% hyperbolic reference curve. The results justify use of the 10% rule in the absence of actual reference curves. The ICPRB report pointed out computational problems with the current assessment methodology but concluded that the James River chlorophyll a criteria are, for the most part, protective of high quality environments in the Chesapeake Bay open water designated uses. Illustration of 10% default reference curve.